Welcome to Native Shore Fiction. Once again, for your reading pleasure, we feature the speed and fulguration of Flash Fiction, giving everyone notice that you don't need a Porsche to have a fast getaway or a ripping good time. Don't forget to enter this year's Flash Fiction Competition brought to you by members of the Word Smitten Story Cove. We begin reading in February and the deadline is May 1, 2003. We wish you success in all your writing! 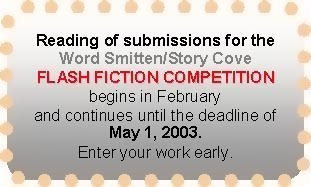 Click here to enter this year's competition and to read all of the guidelines for the 2003 contest: Flash Fiction at Word Smitten's Story Cove. Flash Fiction Competition Winner and remind you to enter this year! Reading begins in February. Deadline is May 1, 2003. Thank you--to everyone who took time to enter our annual spring fiction competition in May of last year. The entries varied from war stories to woman's woes, from barroom brawls to bad HMOs. It made our work even more challenging because so many were so good. We selected a work that makes us laugh and makes us think about the ever-so-human condition, and the rationale, the human hypothesis, we all apply when making simple choices and when accounting for our unaccountable actions. In this edition, we feature the winning author, Wendy Lestina, who wrote "On the Other Hand" and received an award of $150.00 and publication in Word Smitten. In honoring other contributing writers, we nominated three (M. L. Trombetta, Karen Sheets, and A. B. Moore) out of the many who submitted their work to us. We highlight excerpts from their stories in this edition. In addition to the HONORABLE MENTION NOMINEES, look for excerpts from other flash fiction works in a section titled lines we like, because, well, we like reading those sentences. Who doesn't like a phrase that stays with you? An entirely memorable one. We think these selections have staying power. Don't tell us that at some time in your life you have not said, "Make my day." Although these excerpts affected us in a much more interesting way than a line from a Clint Eastwood movie, in their own way they all made our day, and made our day more interesting, by reading them. We think these writers have great potential and although there can be only one winning entry, there are winning lines. We congratulate the authors. Join us in congratulating the nominees and Wendy Lestina, author of the flash fiction story, "ON THE OTHER HAND" featured here. Where is the respect? Here is this girl, I have no idea who she is, a Gillespie maybe, and she's working at the funeral home, wearing a blouse I could see through if I wanted to. She asks if I'm family, and when I say yes, she takes my arm as if she expects me to be the next one to go. I can walk by myself, and I tell her so. I also tell her I don't want to be escorted into a chapel by someone who has a tattoo on her neck even if she is Arleda Gillespie's granddaughter which I am beginning to be certain she is. Six people are sprinkled among four pews. I know them all by the backs of their heads. I see the tip of her nose. Miss Elegant is lying on white satin pillows with powder caked in the canyons of her wrinkles. She'd turn over in her grave if she were there yet. A shuffling of house slippers; a hand squeezes my shoulder. The Gillespie girl appears from behind a Chinese screen. Do I want a few minutes alone with my aunt? I do. I want a few minutes alone with her left hand. She intends to wear it to her grave: the fragile engagement ring, a spider-web of silver supporting a spider-egg diamond, a tourniquet on the finger it had always been too small to encircle. No man gave her that ring. Curt gave it to Florence at the train station when he left for France. He survived the war, survived the influenza, and they were married. She stole the ring during the viewing. My grandmother said, "Just what do you think you're doing, young lady?" She said, "Oh, Florrie wanted me to have this." My grandmother said, "I find this all very hard to believe." A person might say that's water under the bridge. I'm saying, she took the ring off her dead sister's finger and she put it on her own left hand and if you think she moved into my daddy's house to help with the baby, you've got another think coming. He was twenty-three. Already a Captain. She was eighteen, bobbed her hair before she was out of school, and smelled of tobacco. Her beaded dresses, torn from dancing, were stained red in the front from sloe gin and red in the back from not wearing rags. That's who she was and a tiger doesn't change her spots if she lives to be a hundred and loses her hair and goes from fat to crumpled bird -- crumpled bird with fat fingers, leaving the ring for someone else to steal, if it can be called stealing when a person takes something that should have been a person's all along. What's right is right, and eighty years of wrong is, as the Bible says, a mite in the eye of God. If you are wondering, the bird pictured above is one type of a shore bird species known as the curlew. Worldwide, only fifty of the slim-billed curlew remain. We chose this elusive and rare bird as the mascot for our Native Shore Fiction department because as a talisman, a Jungian symbol, it represents this site's Zeitgeist, our native spirit for this decade. Think about it. We could have selected a zucchini.